Over the past year, an increasing number of companies – particularly in tech – have decided to offer unlimited holidays. On the surface, this sounds like a great perk. But the research shows that generally, unlimited holidays results in employees taking less time off. The outcome is not so perky it turns out. Who is encouraging employees to actually take their holiday? Every 3 months or so I look through each employee’s remaining holiday allocation (they get 27 holidays plus the bank/public holidays). If people haven’t taken enough, I encourage them to get some more booked in. At the extreme, I require people to take a bit of time off (even if just long weekends) in the next month or so. Why? Taking regular breaks is good for business performance. They return to work with brains and bodies functioning better. Often reinvigorated by their work. This is the theory that supports ‘unlimited holidays’ but the behaviour that results doesn’t deliver on the theory. Here’s the real rub. Why do people take less holiday when they are given ‘unlimited’? Ultimately, there is a competition (conscious or subconscious) to take less. ‘X seems to be away a lot’ is a negative comment rather than a positive one. When you give people a certain number of holidays and, crucially, expect them to take them, the culture is totally different. 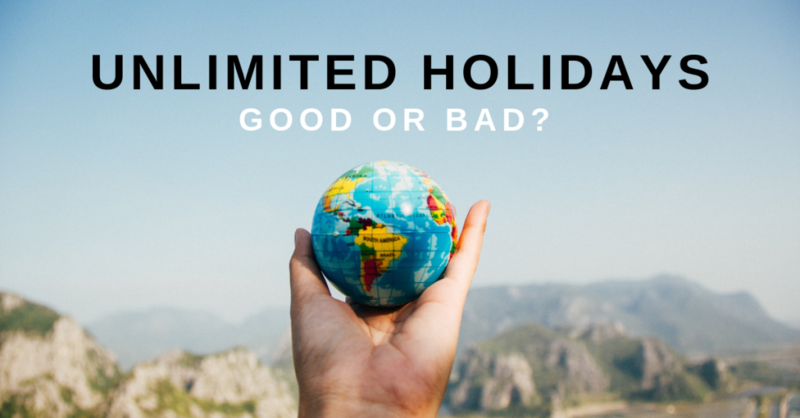 Underpinning the ‘unlimited holiday’ offer is a theory that people will self-regulate based on their performance. If they need to work more to deliver the results required, they will. And if they don’t deliver results, they are held to account. My issue here is that this is a very mature way of thinking. I think it’s only realistic for people who’ve been working a number of years and really understand what good performance is, when good is good enough, how to be super efficient at work, how holidays can actually drive performance etc. etc. I don’t think it’s fair to expect a recent graduate, new to the workplace, to operate at this level. When you’re new to work, it’s far more natural to equate more work to more performance. So you don’t take holiday. So ultimately, I’m not saying unlimited holidays is in itself a bad thing. I’m saying that you also need to empower people at all levels of the organisation to actually take holiday. And for all the reasons above, that’s not an easy thing to do. So, for the time being, I think it’s more authentic (and for me that’s key to any good team culture) to set a generous holiday allowance, support all employees in taking it and help them to understand how time off can actually help them better to achieve their goals.